The first thing I resolved to do was to use two ultrasonic sensors instead of one. 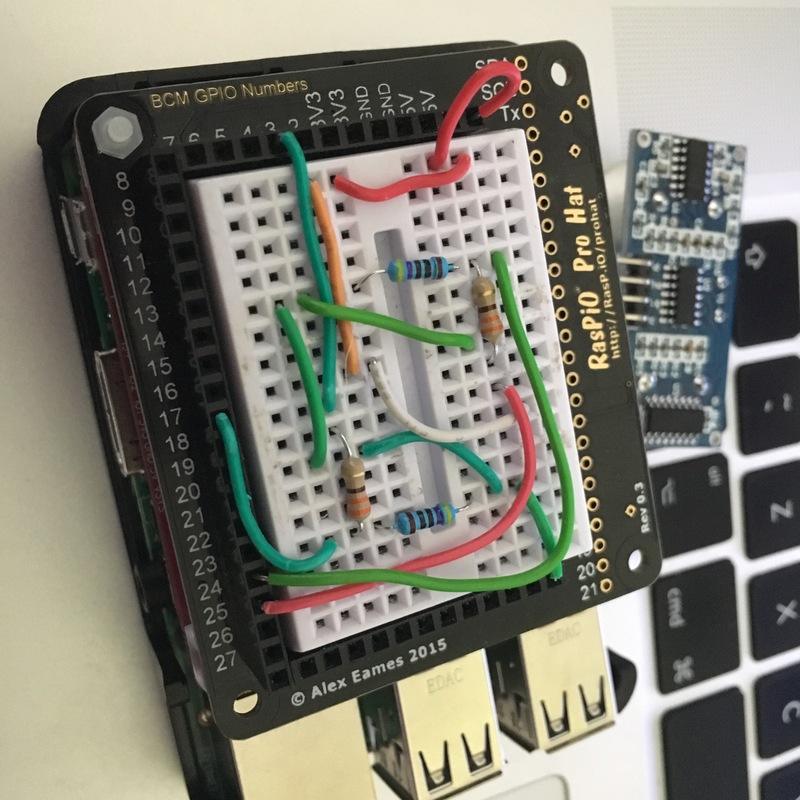 I used the same circuit as the one in the raspberrypi.org article but built it twice on the same breadboard. The first circuit used pins 4 and 17 as in the original, and the second one, used pins 23 and 24 for the trigger and echo signals instead, otherwise being identical. I built the circuit on a RasPiO ProHat board which gives convenient access to all the GPIO pins, as shown in the photographs below. To read the inputs from the two ultrasonic sensors a python script is used. The starting point for the python script is to extract data from the two ultrasonic sensors using the excellent gpiozero library, included by default on the latest Raspbian Stretch image. This makes it very easy to get a series of readings from the two sensors. I have recently received my Kickstarter Pi_Juice board after sdveral years wait :-) and I decided to try it out with this project, as it would mean that the sensor setup: RasPiO board, Pi-Juice board and Raspberry Pi were completely self contained. 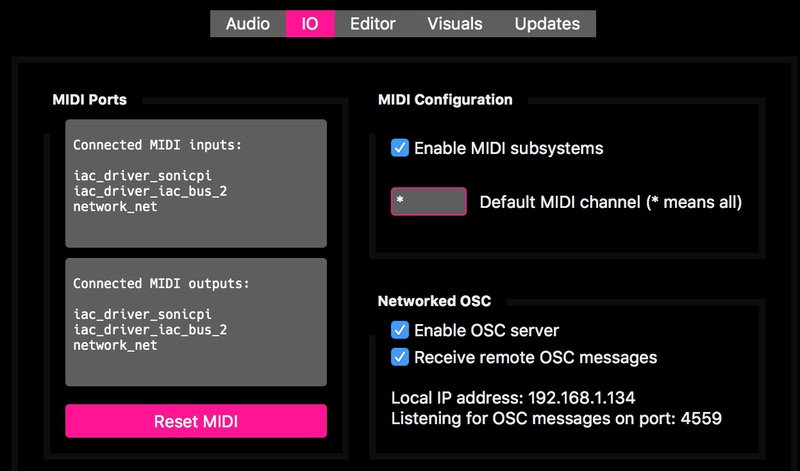 That is why I added the optional input parameter, so that I could send the OSC messages to an external computer on the local network, instead of just using it on the local Raspberry Pi. Of course if you don;t have a second suitable computer on which to run Sonic Pi, you can do all of this using the built in Sonic Pi on Raspbian Stretch (version 3.0.1), although you will need to have a screen and keyboard and speaker attached to your Pi to do so. 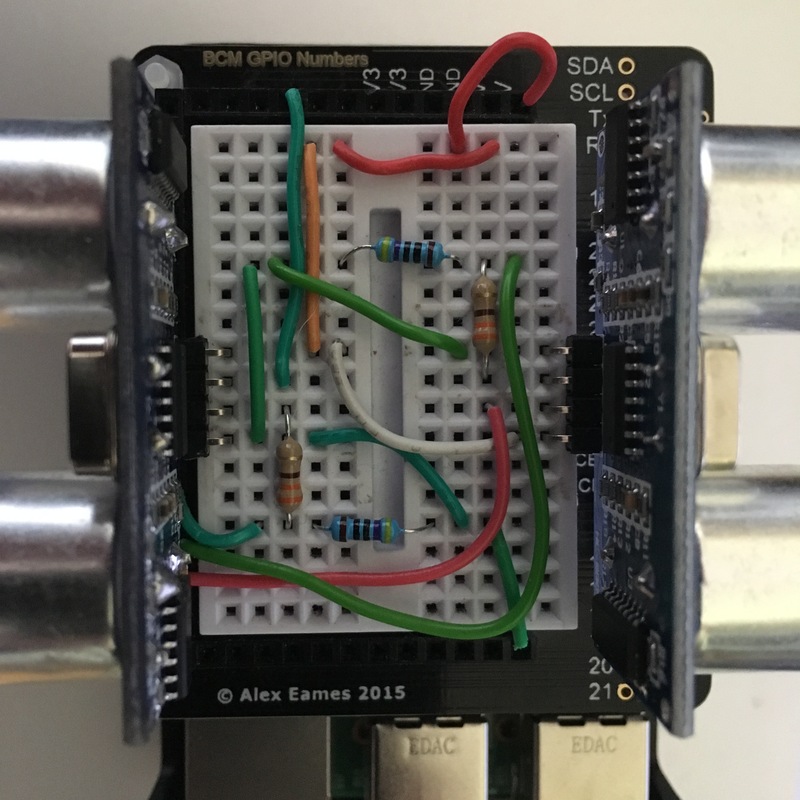 (It IS possible to run Sonic Pi on a headless Raspberry Pi using xdrp, which I have done on other projects, but I don’t want to complicate this post by giving details here). If you are going to use a separate computer for Sonic Pi, then first make sure that your Raspberry Pi is set up to connect automatically to your network via WiFi. (I used a Pi3 with built in Wireless). Then you can use the Raspiconfig utility on the gui preferences menu to set your Pi to boot to the command line (logged in). You should also enable SSH using the same utility. When you do so, you should change the Raspberry Pi password for user pi from the default raspberry to something else you can remember. Again the same utility will let you do that. Note the ip address of your Raspberry Pi on your wireless network, so that you can connect to it remotely. If you don’t want to do this, you can of course leave the Pi connected to screen and keyboard and just start the theremin.py script directly from a terminal window. This started the script running, and it reported in the terminal window. Then if I started moving my hands back and foward near the ultrasound sensors I could see streams of numbers beneath, shown that the readings were geing generated. e.g. That completes the setup for the Raspberry Pi. Moving on to Sonic Pi, this should be started on your second computer (in my case my Macbook Pro). I was using version 3.1 the latest release on this platform. In an empty buffer screen (selected using the tabs at the bottom of the main screen, you should add the following program, either by typing it out or by downloading it from the gist link at the end of this post. Looking at this you will notice that I use the effect :ixi_techno, and further down the program you will see that the :phase value, or the rate at which this effect modulates sounding notes inside the effect are controlled by the value of r2, the second output sent from the two ultrasound sensors. 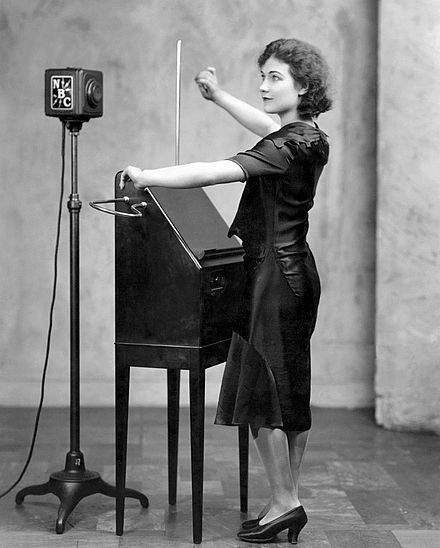 In my initial description of the “real” theremin I said that the two available controls adjusted the pitch or frequency of the notes played and the volume of those notes. Initially I tried adjusting the volume of the notes, and it can be done, but I didn’t find it very effective. Instead I opted to add this optional modulation to the playing note, but the nice thing about Sonic Pi is that it is fairly easy to adjust one of a variety of characteristics using the second number, and I hope to try out some others, and may even find a more satisfying result for volume adjustment in the end. This is then subsequently stored in the time-state as :k so that it can be retrieved and used to alter the pitch of the note according to the value of r1. Notice the use of the octs function to play two notes an octave apart. Initially the pitch is 0 and the volume 0 as well, but this is altered by the control later on. The meat of the program takes place in the live_loop :theremin This waits for an incoming OSC messages addressed to /play/this in the sending program (Sonic PI adds the initial /osc to show the source. This contains the data of the two numbers r1, and r2 in a list. They are retrieved, printed on the screen using the putsPretty function and then processed to control the note. a cutoff value of 60 is taken for the scaled r1 (equivalent to 60cm). For values above this the volume of the note is set to 0 (with a slide time from any previous value of 0.02), and no note sounds. For values below 60 the pitch of the note is adjusted, and the volume restored to 0.7. Again slide times are used, 0.06 for the note adjustment (the time between successive numbers arriving) and a more sedate 0.2 for the volume adjustment. For(scaled) r2 values < 0.8 the phase rate of the modulation is adjusted, and the mix value is set to 0.8. For values > 0.8 the mix value is set to 0, effectively disabling the effect. Again suitable slide times are chosen. I you now run the Sonic Pi program, then you should be able to control what you hear by moving your hands in front of the two sensors.